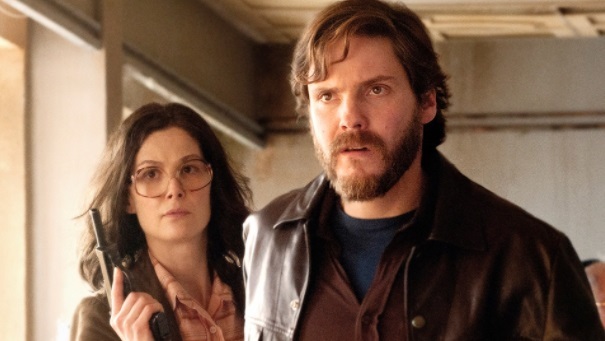 It’s possible that your first reaction when hearing there was a new film telling the story of Operation Entebbe was, really? Followed by, why? There were already 3 movies that covered the real-life story of the 1976 counter-terrorist-hostage-rescue operation, so, why another? True, 2 of the previous films weren’t particularly good. Though released theatrically overseas, both Victory at Entebbe (1976) and Raid on Entebbe (1977) were TV movies. Worse, Victory at Entebbe was shot on videotape then transferred to film. It may have had an all-star cast, including Elizabeth Taylor and Kirk Douglas, but its dull, TV soap-opera look made a plodding script appear even worse. Raid on Entebbe, with Charles Bronson and Peter Finch in his final film, was a considerable improvement. For one thing, it was shot on film (it won an Emmy for cinematography), plus the tension and its buildup to the actual rescue were surprisingly effective. But when viewed theatrically, it suffered from the simple fact that it still looked like a television movie. The third film, Operation Thunderbolt (1977), was an Israeli production made because of how inaccurate the previous two films were considered to be. Though enjoyed by Israeli audiences, most others around the world have never seen the film. In 1978, it received an Academy Award nomination for Best Foreign Film. Much of what occurred in 1976, when two Palestinian and two German terrorists hijacked Air France Flight 139 on its way from Tel Aviv to Paris, was classified. The world read of the audacious raid and subsequent rescue of the plane’s hostages, but many of the details were missing. Then in 2016, a book with lengthy title of Operation Thunderbolt: Flight 139 and the Raid on Entebbe Airport, the Most Audacious Hostage Rescue Mission History by Saul David was published. It meticulously recreated the nail-biting events of those seven days, unveiling much that was once unknown, filling the voids with declassified intel. With all this new information now available, a retelling was inevitable. 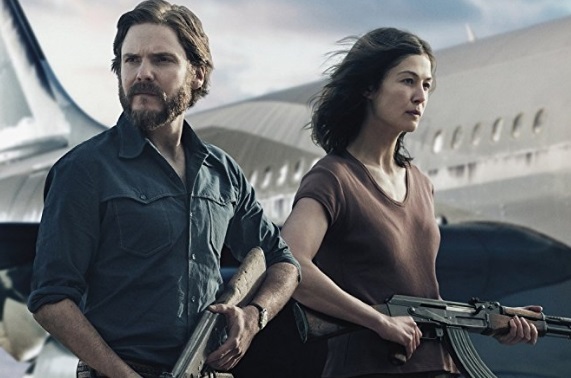 Entebbe, retitled here in the US as 7 Days in Entebbe, is a British production that recreates the whole affair, and it’s mind-numbingly dull. Things begin well. Told in chapters from Day One to Day Seven, the film wastes little time in establishing the hijack. 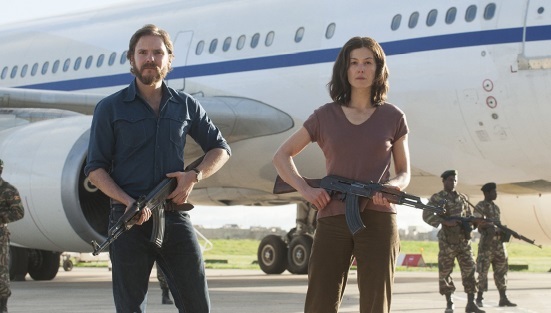 German terrorists (Rosamund Pike and Daniel Bruhl) board Flight 139 during a stopover in Athens, Greece. Along with two Palestinian gunmen, the hijackers take control, demanding a ransom of $5 million dollars for the plane and the release of 53 Palestinian militants. Naturally, Israel repeats its stance of never negotiating with terrorists. So far, so good. After refueling in Benghazi, the plane was then diverted to an abandoned section of Entebbe airport in Uganda, where it remained. The country’s leader, the monstrous dictator Idi Amin Dada (Nonso Anozie) even greets the hostages with smiles and open arms. “You’re in good hands,” he assures them as the kidnapped passengers, most of whom are from Israel, are herded into a disused part of the airport, away from the bustling main section. But it’s not long before the film’s pacing problems emerge. The debates among the members of the Israeli government are initially compelling. Watching Prime Minister Yitzhak Rabin (Lior Ashkenazi) spar with Shimon Peres (Eddie Marsan) is particularly insightful. “You want to invade Uganda?” asks the PM. “We give it back when we leave,” Peres responds. But what you think should be a tension-filled series of events, ultimately leading day by day to a nerve-racking, explosive, edge-of-your-seat conclusion, turns into a plod. Plus, Rosamund Pike’s Brigitte Kuhlmann carries a practically unreadable blank stare throughout the entire film. A scene where she wanders across the airport at night in a daze and enters the busy terminal on the other side is virtually unexplainable. She calls a friend long-distance on a payphone and leaves a lengthy message, except that the phone is out of order. Yet even when told the receiver isn’t working, she completes the message. It’s as if an extra from The Walking Dead had wandered on the set and brought the film to a grinding halt. One important detail that was declassified since the making of the seventies movies was the outcome to the fate of Israeli-British passenger Dora Bloch. As played by Sylvia Sydney in Raid on Entebbe, Dora was taken ill and moved to a hospital in Kampala before the rescue operation. At the end credits, we learned that an official from the British Consulate visited Dora in the hospital and found that she was recovering from her illness. But when he returned to visit her again, her bed was empty. She simply vanished. We now know that her body was later discovered buried in a sugar plantation near Uganda’s capital. Idi Ami, furious and humiliated that all the passengers were rescued from right under his nose, ordered her execution. It’s a sad yet fascinating footnote to what was an unsolved part of the story. 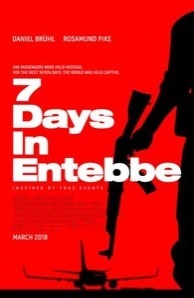 7 Days in Entebbe doesn’t even mention it, and to its shame, Dora Bloch’s character is a virtual no show in the film. But worst of all is the film’s constant nod to the rehearsals back in Israel of a performance piece by the Batsheva Dance Company. One of the dancers is the girlfriend to an Israeli commando on the mission to rescue the passengers in Entebbe, yet this hardly justifies the dance company’s inclusion and the continual juxtaposition between the tension building rescue operation and the experimental stage . When the dance is presented to a live audience, the performance takes place during the actual rescue. The camera appears to linger longer on the dancers than it does on the rescue. Maybe it was intended as a moment of artful inspiration, comparing the action of the dancers to the audacious operation, giving everything a thoughtful, contrasting effect. It’s the worst payoff to any thriller seen in years. I guarantee, no matter what director Jose Padhilla was intending, this is not what an audience is looking for in a disaster crime thriller. They’re looking for the unflagging excitement of a Paul Greengrass movie where the story is told in action; instead, they’re watching grass grow.